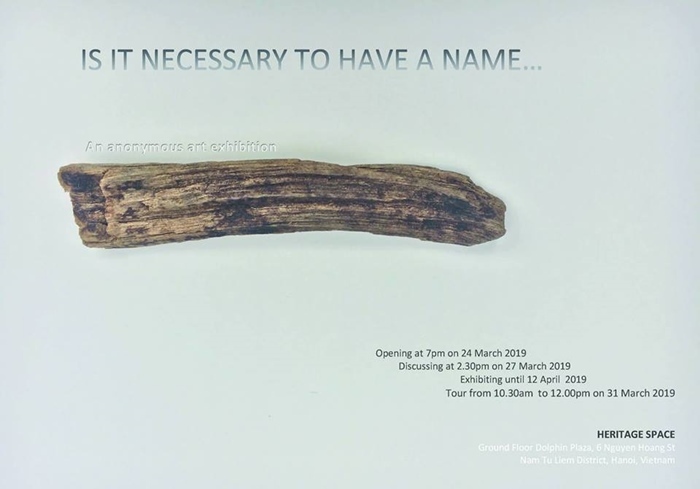 You are invited to a discussion with the anonymous artists of the exhibition ‘IS IT NECESSARY TO HAVE A NAME…’ – the ongoing unnamed art exhibition at Heritage Space’s gallery. – What makes the true value of art? – The conveys of the profound message of art? – The deep enlightening that transcends everyday life? – The bravery engagement and acceptance of adversity so much that it is incomprehensible? Inspired by the quote: “Every man is born as many men and dies as a single one” by Martin Heidegger, the artists have been challenging themselves by taking the anonymous adventure of 14 months of reflection, questioning and working by themselves. The aim is to strip off their own identities and personalities in order to reach the core of art and creation. If you are interested in the working process of these anonymous artists and want to find out who are they and why they chose to participate in this exhibition, come and discuss with them. Free admission. The discussion will be in Vietnamese with English interpretation.